For centuries, the lives of Russian peasants revolved around the production and use of homespun cloth. 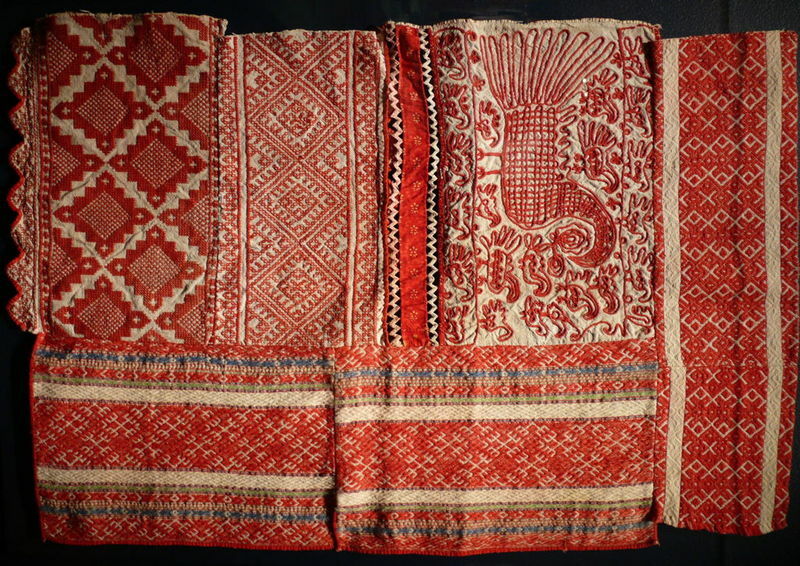 From birth to death, the traditions of cloth-making bound communities together. Newborn infants were tied around the waist with a piece of thread spun during the Holy Week, and coffins were lowered into the grave on special hand-woven towels. Russian peasants, men and women alike, wore garments made of homespun flax. Flax was grown in northern and central Russia for millennia. In the times of the tsars, flax was Russia’s national treasure, and by the 18th century, most linen factories in England and France were using Russian flax fiber. A uniquely female occupation, the process of turning raw flax into useful linen was long and painstaking. Women planted and harvested flax, breaking and combing it to make the fibers soft and lustrous. The fibers were then ready for hand-spinning, a labor intensive process that required even the most skilled spinner a full day to produce 350 yards of flax thread—barely enough to weave seven to nine inches of a traditional linen towel. Made from scratch, textiles were highly valued, carefully used, lovingly stored and never thrown away. Linen undergarments could last a lifetime, outerwear was passed on to the next generation, and only gloves made of linen were quickly worn out by the deft hands of hard-working Russian peasants. Tirelessly spinning from as early as age five or six, peasant girls proved their value as brides through the quality and quantity of clothes they produced. Taught by older women, young peasant girls learned the secrets of spinning and weaving as well as the intricate patterns of embroidery. In a thrifty peasant household, embroidered ends of worn towels and bed skirts were sewn together to serve as a manual of embroidery for future generations. These ‘cloth books’ have preserved the ancient language of embroidery written in thread.